We have reached Day #5 in our 12 Days of Wonder in our quick ascent towards the holidays. Today’s spotlight science toy is Magna-Tiles. Steve Spangler Science is celebrating the 12 Days of Wonder and highlighting our top 12 science toys and kits that are perfect to put under the tree. As blog editor, social media coordinator and mom of two budding scientists, I will share my review of each product. Steve Spangler Science also found 12 respected, popular mom bloggers to each test and review one of our 12 science gifts. I will include a link to their blogs and their honest reviews of each gift idea at the bottom of this post. Today, Jen from Projects for Preschoolers shares her review. The kit is also the Deal of the Day. So check our blog every day for the next few weeks to learn all about our 12 Days of Wonder. My girls and I have loved Magna-Tiles since we first started carrying them at Steve Spangler Science several years ago. It is the one and only “toy” that we store in our family room. These aren’t your ordinary building blocks. There really isn’t a point in putting our box of Magna-Tiles away, because it is pulled out so frequently. Our first set was the colored Magna-Tiles and since then we have added on a few of the Clear Magna-Tiles sets. I had to at least double what we started out with, as my daughters were constantly fighting over who got what to complete their creation. Even with a few sets, they still argue, but they have more than enough to build super structures if they combine their efforts. Magna-Tiles are tiles about 1/3 inch thick with magnets around the edges. Stick two edges together and build different shapes. The box also comes with a picture-guide showing how to build three dimensional soccer balls, dogs, cats and geometric shapes. You can build 3-D structures or lay them flat and build 2-D. Imagination is endless and my kids like to come up with new ways to get the pieces to stick together and hold. Not all designs work. But that’s the nice part. In one mighty crash, the Magna-Tiles come down and you can start over quickly. 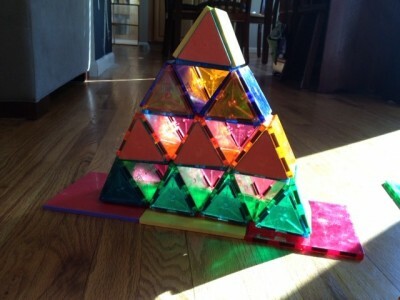 This can be frustrating for some children, but they quickly learn everything is temporary in the land of Magna-Tiles. Magna-Tiles also teaches geometric shapes and kids learn which triangles go together to form squares and rectangles. The directions also show you how to build a 3-D soccer ball out of triangles – a round shape made from 3-sided shapes. When we had cousins visiting this summer, the Magna-Tiles formed a small city around our family room that was modified every day. They took the tiles out every chance they got. I know exactly what I am getting the cousins for Christmas this year. Even our neighbor, who is in middle school, comes over and builds with the Magna-Tiles. The solid colors are great and add a rainbow to your structure. The clear tiles are also a lot of fun. My girls like to add battery operated tea lights inside for a special effect. They also like to use their Littlest Pet Shop creatures with their Magna-Tile houses because LPS also contains magnets. One set is enough to build and have fun with but if you have a serious architect, I recommend more than one set. These are pricey, so take advantage of the discounted price available only today. Many thanks to Jen at Projects for Preschoolers for testing our Magna-Tiles. Visit Projects for Preschoolers. Follow them on Facebook and Twitter. I would like to buy a set of magna-tiles and I just want to ask you 1 quastion, can you please tell me what prevents the tiles that it shouldn’t open? And when kids or adults step on them or an hard object would fall on the tile would it brake? And if it won’t brake can you pleease tell me what protects it from braking ?